It has been quite the busy Summer and I can’t believe it is already Fall! I have moved into a new place and got a new job all in this past month and unfortunately, have had little time to work on my blog. However, I have still made time to test new recipes and gather more ideas to share with you soon! Although I would love to get to a point where I have time to blog recipes on a regular basis, I know it isn’t always realistic. My hope is that you will still follow what I post and try my recipes throughout your own busy life. I can guarantee this recipe will not disappoint and will soon become a weekend staple as it has for my house! Enjoy! Plug in your waffle iron to start warming up. Take a carton of fresh strawberries and pulse them in a blender until smooth. I used my magic bullet and it took about 1 container of strawberries to make 1 1/4c of blended strawberries. Whisk eggs together in a medium-large size bowl. Add vanilla and melted coconut oil. In a separate bowl, mix together flour, protein powder, baking soda, cocoa powder and salt. Slowly add the dry ingredient mix into the wet ingredients. Stir together until everything is mixed together. Add the chocolate chips into the waffle mix and then transfer into a measuring cup or other easy to pour container. Use the coconut oil spray to grease both sides of the waffle iron. When the waffle iron is ready, pour mixture into your waffle iron and close the lid until cooked through. 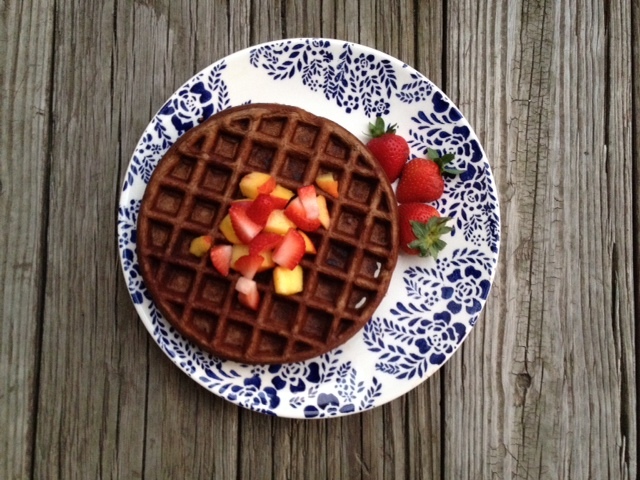 My waffle iron takes about 3 minutes to make the waffles crisp and delicious. You will just need to test out your own iron to see how long they will take. Note: Before you pour each waffle into the iron stir the waffle mixture. The chocolate chips sink to the bottom of the mixture so you need to continue to stir them to the top so they are evenly distributed when you are making your waffles. *This recipe was adapted from a post I saw here!